My father had a paperback copy of it. You see Mia Farrow reading the paperback in the first 20 minutes of ROSEMARY'S BABY (1968). THE MAN by Irving Wallace, published in 1964, was a novel that got big attention. During the brutality and beautiful accomplishments of that Civil Rights decade, he wrote a novel about a black man rising to the office of President. 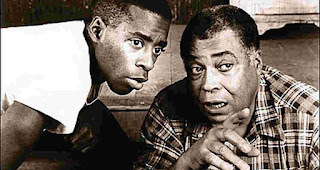 This story by Irving Wallace would later develop into a project that would be another credit for the second black man in history to be an Oscar nominee for Best Actor. Come the 1990s, whenever we saw a movie in which a black man could or did become our Commander-in-Chief, it was either played for laughs (Chris Rock in 2003's HEAD OF STATE, Terry Crews in 2006's IDIOCRACY) or it was in a sci-fi disaster film (Morgan Freeman in 1998's DEEP IMPACT). 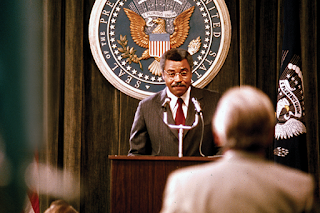 Irving Wallace's novel was a serious story about the social and political effects of a black politician being appointed President of the United States. Sidney Poitier was the first black man to be an Oscar nominee for Best Actor. He won the Oscar for 1963's LILIES OF THE FIELD. Two of the biggest box office hits of 1967 starred Sidney Poitier. Come the following year, GUESS WHO'S COMING TO DINNER and IN THE HEAT OF THE NIGHT would be two of the five Oscar nominees for Best Picture of 1967. IN THE HEAT OF THE NIGHT won. Poitier was a top box office star of the 1960s. A first for a black actor. Did a major Hollywood studio snap up the big screen rights to THE MAN and adapt it into a deluxe major motion picture for Sidney Poitier? Apparently not. Broadway Tony winner JAMES EARL JONES was the second black man to be an Oscar nominee for Best Actor. 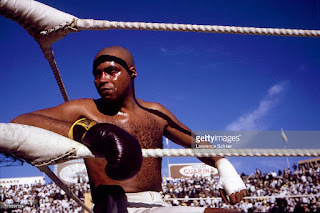 He was nominated for recreating his Tony-winning dramatic performance as a championship boxer in the early 1900s fighting bigotry in THE GREAT WHITE HOPE (1970). THE MAN got a modest production budget and was adapted into what was basically a 90-minute made-for-TV movie that aired on ABC in 1972. Rod Serling, the TV visionary who gave us THE TWILIGHT ZONE, wrote the script. You can tell the budget was modest. The Forum in Inglewood, California passes for a building in Washington, D.C. I grew up in Los Angeles and recognized the Forum's exterior right away. James Earl Jones got the part of President Douglass Dilman. He is remarkable in the role. Despite the low budget, THE MAN drew some top talent into the cast to join James Earl Jones. Veteran Hollywood stars from the 1930s & 40s are in it. There's Burgess Meredith, Lew Ayres and Patric Knowles ("Lindsay" in AUNTIE MAME). I felt that those movie veterans really bit into their roles with gusto because they were denied that kind of honest social material with an interracial cast in the old days of Hollywood's Production Code. Janet MacLachlan is very good opposite Jones. The late actress played the First Daughter. Is this an excellent made-for-TV movie? No. But it's rich with excellent performances. A memorable moment, one that highlights the brilliance of actor James Earl Jones, is the moment he realizes he is now President of the United States. It's a small, truthful reaction from such a man. Keep your eye on the glass in his hand. Hollywood should've had more lead role opportunities for James Earl Jones so he could gotten a second Oscar nomination. And more. James Earl Jones won his second Best Actor Tony Award for the original 1987 production of August Wilson's FENCES. People were slapped in the face with the harsh reality that America did not instantly become "post-racial" when President Obama was elected to his first term. We've really seen it in the President's second term and during the campaign of a candidate (R) out to replace him. 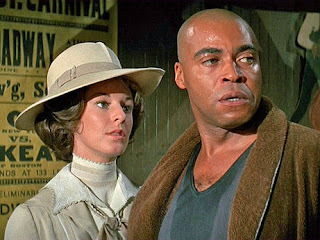 THE MAN is worth seeing now as we look at what America accomplished electing Barack Obama to the White House, it's worth seeing for where we are now and it's worth seeing for the extraordinary James Earl Jones. God bless America, land that I love. Enjoy THE MAN while he's here.